(Updated 11 April): Now being screened in the UK is this fun Thunderbirds-inspired advertisement for Specsavers featuring an updated Virgil Tracy and The Hood in a mini adventure to promote their Specsavers Reaction lenses. The advertisement was shot using the same techniques as employed in the original 1960s production. The mini adventure sees Virgil pursued by his arch-enemy, the villainous Hood, through snow capped mountains. Virgil comes out of a tunnel into the glare of the sun and his Specsavers lenses immediately darken to protect his vision. The Hood is not so lucky and, blinded by the bright light, he crashes into a mountain. The chase is over and Virgil escapes again, thanks to modern technology, and to the relief of his father, Jeff. Specsavers Creative Director Graham Daldry worked with director Tobias Fouracre at Tandem Films to film the new TV ad, which recreates the excitement of the hit 1960s children’s series, including the original Thunderbirds March music written by Barry Gray. "It was a fascinating experience working with the guys from International Rescue and The Hood," says Daldry. "They were all extremely professional and I was particularly impressed by the fact that The Hood did his own stunts (and yes, he did walk away from the explosion). "It's been a long time since they were on our screens and we hope that the Specsavers advert will relaunch their careers." 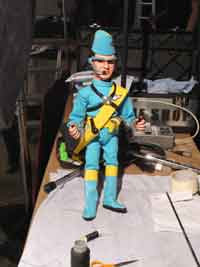 The filming, which took place in Clapham Studios in London, marked a departure from computer-generated imagery in an effort to stay as close as possible to the original "Supermarionation" production techniques. 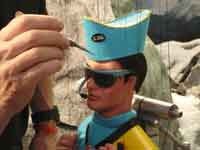 This meant enlisting experts who had worked on the original supermarionation, using miniatures for the wide shots and filming a chemical explosion. The team even got to work with one of the puppeteers from the original series. The commercial is already attracting interest from die-hard Thunderbirds fans, and Granada Studios, who own the rights to the original series, haven’t ruled out that it may be shown on our screens again in the future. Says a spokesman; ‘We are delighted to introduce Thunderbirds to a new generation." Every Letter Printed Wins A T-Shirt!